Marisha said: "There is one bookstore in Chisinau downtown. I don't recall exactly its name, but think it's Oxford center. It's situated on Mihai Eminescu street between Stefan Cel Mare and Mitropolit Varlaam opposite to Odeon cinema. They sell mainly language learning materials, but have few shelves with English books too. Classic literature mainly." 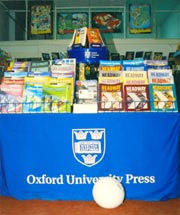 This bookstore, located in the center of Moldova’s capital Chisinau, is an official representative of Oxford University Press – English Language Teaching Department. It offers a wide selection of books and other material (CDs, DVDs, video and audio tapes) for teachers and students of English language. The bookstore’s primary ambition is, as its name hints, to serve as an educational centre spreading the English language. Their stock is the best reflection of this ambition. Besides ELT books you can also find academic works from other fields such as humanities, social sciences and even medicine. The fiction section of the bookstore is rather modest, but you surely won’t miss by picking something from the Oxford World’s Classics series, comprising titles from the ancient ages all the way to the most influential novels of the 20th century.